I am a freshman (Class of 2019), planning on double majoring in History of Art and Economics and minoring in Museums and Society. I am fascinated by the intersection of the worlds of art history and archaeology and I am excited to further explore this intertwined relation. 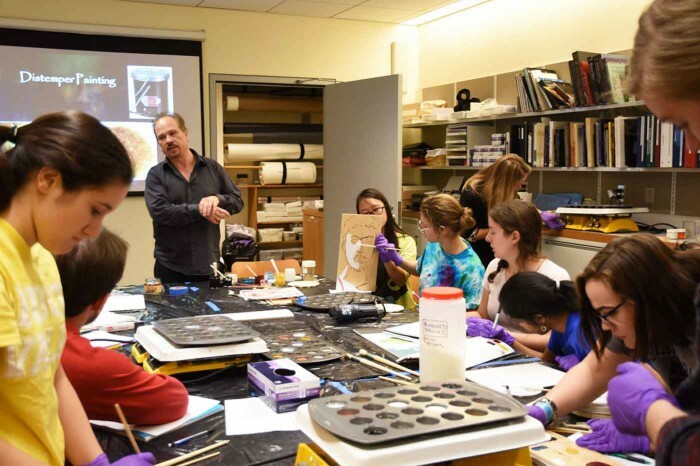 Brian Baade (center) and Kristin DeGhetaldi (adjusting hot plates) discuss encaustic and tempera painting. This week we were visited by Brian Baade, Assistant Professor, and Kristin DeGhetaldi, graduate student, both paintings conservators affiliated with the University of Delaware. With them they brought encaustic paint—pigments mixed with beeswax—and two kinds of tempera paint, one made of animal skin glue and the other of acacia gum. They brought these three different kinds of paints because we cannot be certain about the specific paints used on our mummy portraits without further chemical analysis. We began class by discussing the different components of paint. To make a paint, you need two things: a pigment and a binder. A binder can be most sticky things, like wax, animal based glues, or plant gums, which have all been identified on Roman Egyptian paintings. Ancient Egyptians obtained their pigments from several sources. Their pigments can be split into two categories—organic and inorganic. Organic pigments are categorized based on the presence of carbon and tend to come from once living sources. Some organic pigments we worked with include bone black (from burnt bones), indigo (from the plant), and rose madder (from the madder root). Inorganic pigments typically come from mineral sources, and some can be toxic. Some inorganic pigments we worked with are red lead, lead white, and Egyptian blue. All of these colors have been found on ancient Roman Egyptian mummy portraits. After a brief lecture on the basics of painting, we began to work with the paints. We had prepared wooden panels that closely resembled the characteristics of the wood identified on mummy portraits. Instead of European lime wood, we used American basswood, and North Atlantic cedar was used for Lebanese cedar. In antiquity, these woods were prized for their strength and flexibility even when cut very thin, and also produced light boards with minimal cracking and smooth surfaces for painting. Some of our boards were sized with animal glue and the rest were sized with animal glue and gypsum (calcium sulfate mixed with animal glue). We began by sketching drawings on the boards in charcoal, as some evidence from ancient examples suggest. We then began first by painting with pigments mixed with acacia glue, then attempted pigments mixed with animal glue, then pigments in beeswax (or encaustic), and finally beeswax mixed with resin (“Punic wax”). Our finished panels, with a tray of encaustic paints visible on the upper left. We observed the differences between the various paints applied to the different woods with different preparation. Overall, it was decided that encaustic paints were the hardest to work with because the pigmented wax, which had to be heated on hot plates to be usable as a paint, cooled remarkably fast. As soon as we would apply even the tempera-based paints, they seemed to dry immediately, leaving us unable to paint anything besides blobs of color. To try to work the paint a bit more and mimic the tool marks found on our portraits, we heated metal tools and pressed them into the painted wax, simultaneously melting and shaping the paint. While this worked for very small areas of paint, we had to keep a constant heat source on the tool in order for it to function over large portions of painted surface. Towards the end of class, we experimented with the process of gilding. This procedure was also extremely difficult. The thin pieces of gold would flutter away at the slightest hint of a breath; in order for them to stick to our painted wood, we had to paint additional glue on our panels, or heat the encaustic slightly to get the gold to adhere. As a class, we had a newfound appreciation for the artists of our portraits because all of the possible paints they had to work with were incredibly difficult to manipulate. We hope this will elucidate the medium and painting techniques of our mummy portraits. Getting to paint with the different encaustic and tempera paints was a great experience. I wonder if the painters of our portraits had just as difficult as a time as we did? Since Egypt has such a hot climate, I bet they were able to manipulate the paints better. Nice article! Great post Jess, love the title too! One thing I was thinking about was how chunky our encaustic looked. It might just be our amateur attempt and lack of skill, but the portraits we have look so much glossier. I wonder if it’s just time and wear or if there’s a different technical component we are missing for how artists would’ve painted the young man and man? The difficulty of encaustic painting is beyond imagination. Maria and I joked that it is “fast and furious”. Like Sarah mentioned, the encaustic looked very chunky. Comparatively the medium of the Portrait of the Man is fairly thin but at the same time requires the artiest quite some skills. In addition, the seemingly similar color might contain totally different color pigments, the fact that we should keep in mind when analyzing pigments on the portrait. Nicely done Tess! 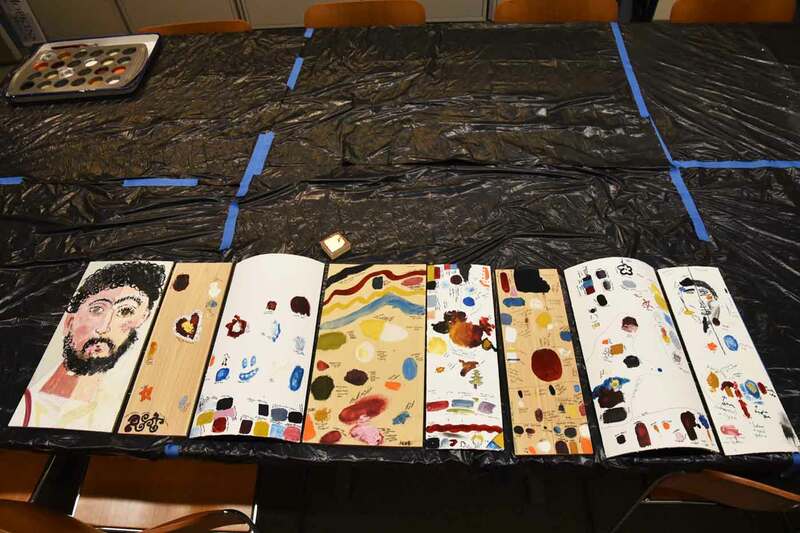 While this week’s topic was clearly very fun, it also taught us a lot about what it was like to work with the different paints and materials that they worked with to create the mummy portraits. This session really allowed us to imagine understand the difficulty of the techniques that were carried out. Great article Tess! Good post Tess! I definitely agree that I found a large appreciation for the skills of the artist. It may not look like it to people who have not used it before but encaustic paint is extremely hard to manipulate and very easy to mess up. Both Brian Baade and Kristin DeGhetaldi were extremely helpful and encouraging and it was extremely fun to learn how to paint and guild under their guidance. Their skills alone were extremely impressive and I was Betty glad that they took the time to come and teach us. After this class, I have so much more respect for the Egyptian artists. I could barely make basic shapes with the encaustic paint, let alone an entire portrait. It makes me wonder how much training the artist apprentices had to go through before they became masters. This workshop was an awesome experience. One thing I would love to do if we had the time is to possibly investigate how our own boards react to various conditions, such as changes in humidity. Now that we have wood of similar properties to that used for the mummy portraits, I think it would interesting to experiment with the boards and test their durability (how they crack) and how they respond to extreme conditions, such as those of the desert, considering this is where many of mummy portraits were stored. I found the fact that the gilding had survived this long insanely fascinating. From the demonstrations in class and actually being able to do some gilding of my own, I observed the incredibly delicate nature of gold foil and how easily it could disintegrate and blow away with even the slightest of breath grazing it. Mr. Baade did mention in his demonstration that gold foil nowadays is much, much thinner as compared to that of Ancient Egyptian times thanks to machine pressing, but I’d imagine it was still extremely delicate back then and commend the artists of our mummy portraits. The encaustic workshop was an amazing experience. Working with encaustic was very difficult because of how fast the wax dried. I have so much more respect now for the painters that made these amazing paintings. I thought it was especially interesting that some of the boards warped. Maybe this would have helped to fit them over the mummies heads? Great article Tess! While discovering the texture and properties of encaustic on your own in an artistic fashion, I realize that I have missed the point. It should have been more productive to test out all the combinations of pigmented wax with each other. This way we could have already been at a farther point in identifying the encaustic used. Was it considered whether the wood panel itself may have been heated to facilitate the application and manipulation of the painting medium? It seems likely–just heating the paints by themselves would give you a paintable medium for just a few seconds, so in order to create the fluid strokes we seen on the paintings, it might have worked better to have the panel warmed (maybe even by the sun?) somehow in addition to heating the paints.